The Maya are probably the best-known of the classical civilizations of Mesoamerica. Originating in the Yucatan around 2600 B.C., they rose to prominence around A.D. 250 in present-day southern Mexico, Guatemala, western Honduras, El Salvador, and northern Belize. Building on the inherited inventions and ideas of earlier civilizations such as the Olmec, the Mayans developed astronomy, calendrical systems and hieroglyphic writing. The Mayans were noted as well for elaborate and highly decorated ceremonial architecture, including temple-pyramids, palaces and observatories, all built without metal tools. They were also skilled farmers, clearing large sections of tropical rain forest and, where groundwater was scarce, building sizeable underground reservoirs for the storage of rainwater. The Mayans were equally skilled as weavers and potters, and cleared routes through jungles and swamps to foster extensive trade networks with distant peoples. Many people believe that the ancestors of the Mayans crossed the Bering Strait at least 20,000 years ago. They were nomadic hunter-gatherers. Evidence of settled habitation in Mexico is found in the Archaic period 5000-1500 BC - corn cultivation, basic pottery and stone tools. The first true civilization was established with the rise of the Olmecs in the Pre-Classic period 1500 BC -300 AD. The Olmecs settled on the Gulf Coast, and little is known about them. The Mayans are regarded as the inventors of many aspects of Meso-American cultures including the first calendar and hieroglyphic writing in the Western hemisphere. Archeologists have not settled the relationship between the Olmecs and the Mayans, and it is a mystery whether the Mayans were their descendants, trading partners, or had another relationship. It is agreed that the Mayans developed a complex calendar and the most elaborate form of hieroglyphics in America, both based on the Olmec's versions. Mayans seem to have entered Yucatan from the west. 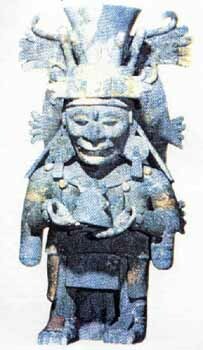 As usual with ancient nations, it is difficult in the beginning to separate myth from history, their earliest mentioned leader and deified hero, Itzamná, being considered to be simply a sun-god common to the Mayan civilization. He is represented as having led the first migration from the Far East, beyond the ocean, along a pathway miraculously opened through the waters. The second migration, which seems to have been historic, was led from the west by Kukulcan, a miraculous priest and teacher, who became the founder of the Mayan kingdom and civilization. Fairly good authority, based upon study of the Mayans chronicles and calendar, places this beginning near the close of the second century of the Christian Era. Under Kukulcan the people were divided into four tribes, ruled by as many kingly families: the Cocom, Tutul-xiu, Itzá and Chele. To the first family belonged Kukulcan himself, who established his residence at Mayanspan, which thus became the capital of the whole nation. The Tutul-xiu held vassal rule at Uxmal, the Itzá at Chichen-Itzá, and the Chelé at Izamal. 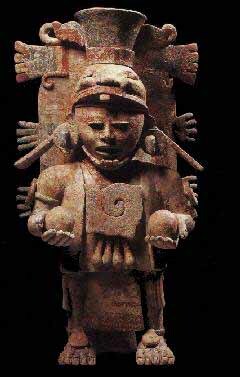 To the Chele was appointed the hereditary high priesthood, and their city became the sacred city of the Mayans. Each provincial king was obliged to spend a part of each year with the monarch at Mayapan. This condition continued down to about the eleventh century, when, as the result of a successful revolt of the provincial kings, Mayapan was destroyed, and the supreme rule passed to the Tutul-xiu at Uxmal. 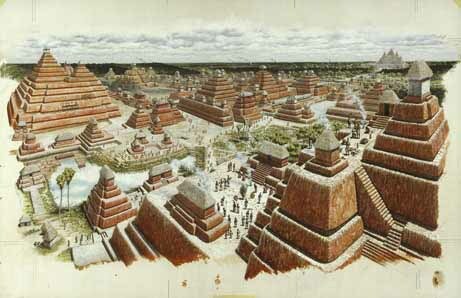 Later on Mayapan was rebuilt and was again the capital of the nation until about the middle of the fifteenth century, when, in consequence of a general revolt against the reigning dynasty, it was finally destroyed, and the monarchy was split up into a number of independent petty states, of which eighteen existed on the peninsula at the arrival of the Spaniards. In consequence of this civil war a part of the Itzá emigrated south to Lake Petén, in Guatemala, where they established a kingdom with their capital and sacred city of Flores Island in the lake. Most artistic and cultural achievement came about during the Classic period 300 - 900 AD. The Mayans developed a complex, hierarchical society divided into classes and professions. Centralized governments, headed by a king, ruled territories with clearly defined boundaries. These borders changed as the various states lost and gained control over territory. Mayansn centers flourished in Mexico, Guatemala, Belize, Honduras, and El Salvador. The major cities of the Classic period were Tikal (Guatemala), Palenque and Yaxchilán (Chiapas, Mexico), Copán and Quirigua (Honduras). For most of this period, the majority of the Mayans population lived in the central lowlands of Mexico and Belize. The Northern Yucatan (where present day Cancun is located) was sparsely populated for most of the Classic period with only a few cities such as Dzibilchaltún (near Mérida) and Xpuhil, Becán and Chicanná (near Chetumal). During the 9th century the population centers of the central lowlands declined significantly. This decline was very rapid and is attributed to famine, drought, breakdowns in trade, and political fragmentation. Fragmentation from large states into smaller city-states focused resources on rivalries between cities including not just wars, but competitions of architecture and art between rival cities. As the cities in the lowlands declined, urban centers sprung up in the Northern Yucatán, including Uxmal (near Mérida). Anthropologists used to contrast the "peaceful" Mayans with the bloodthirsty Aztecs of central Mexico. Although human sacrifice was not as important to the Mayans as to the Aztec, blood sacrifice played a major role in their religion. Individuals offered up their blood, but not necessarily their lives, to the gods through painful methods using sharp instruments such as sting-ray spines or performed ritualistic self mutilation. It is probable that people of all classes shed their blood during religious rites. The king's blood sacrifice was the most valuable and took place more frequently. The Mayans were warlike and raided their neighbors for land, citizens, and captives. Some captives were subjected to the double sacrifice where the victims heart was torn out for the sun and head cut off to pour blood out for the earth. The Mayansn civilization was the height of pre-Columbian culture. They made significant discoveries in science, including the use of the zero in mathematics. Their writing was the only in America capable of expressing all types of thought. Glyphs either represent syllables or whole concepts and were written on long strips of paper or carved and painted on stone. They are arranged to be red from left to right and top to bottom in pairs of columns. The Mayansn calendar begins around 3114 BC, before Mayans culture existed, and could measure time well into the future. They wrote detailed histories and used their calendar to predict the future and astrological events. Fray Diego de Landa, second bishop of the Yucatán ordered a mass destruction of Mayansn books in 1562 and only three survived. After the Classic period, the Mayans migrated to the Yucatán peninsula. There they developed their own character, although their accomplishments and artwork are not considered as impressive as the Classic Mayans. Most of the ruins you can see South of Cancun are from this time period and are definitely worth a visit. Chichen Itza (near Valladolid), Uxmal (near Merida) and Mayanspán (west of Chichen Itza) were the three most important cities during the Post Classic period. They lived in relative peace from around 1000 - 1100 AD when Mayanspán overthrew the confederation and ruled for over 200 years. In 1441 the Mayans who had previously ruled Uxmal destroyed the city of Mayanspán and founded a new city at Mani. Wars were fought between rival Mayansn groups over the territory until the region was conquered by the Spanish. Chichen Itza was first populated between 500 and 900 AD by Mayans and for some reason abandoned around 900, the city was then resettled 100 years later and subsequently invaded by Toltecs from the North. 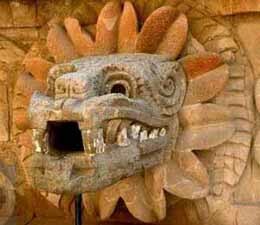 There are numerous reliefs of both Mayan gods including Chac and the Toltec gods including Quetzalcoatl. For some reason the city was abandoned around 1300. If the Spanish did not make it a policy to kill all of the Mayan priests and burn books when they arrived in Mexico, we would all have a few more answers. On his second voyage Columbus heard of Yucatan as a distant country of clothed men. On his fifth voyage (1503-04) he encountered, south-west of Cuba, a canoe-load of Indians with cotton clothing for barter, who said that they came from the ancient Mayan civilization. In 1506 Pinzon sighted the coast, and in 1511 twenty men under Valdivia were wrecked on the shores of the sacred island of Cozumel, several being captured and sacrificed to the idols. The Spanish colonization of the islands of Hispaniola and Cuba allowed them to launch exploratory forays around the Caribbean. Córdoba discovered Isla Mujeres in 1517 and sailed down the Yucatán Gulf coast to were he suffered heavy losses at the hands of the Mayans. Cortés set sail in 1519 and landed in Veracruz. He conquered the Aztecs in a year, but it took another 20 years to conquer the Yucatán. In 1526 Francisco Montejo set out to conquer the Yucatan. The Mayans fought the invaders for 20 years, but eventually succumbed. The Mayans were slaughtered during the battles with the Spaniards, but imported European diseases decimated the population. 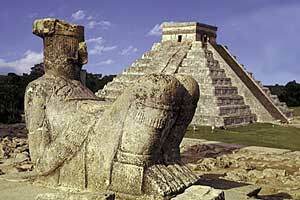 The Mayans were moved into villages and paid heavy taxes to the Spanish government. There were periodic rebellions against the Spanish. The Yucatan Mayans launched a major uprising starting in July 1847 called the Caste War. The Spanish were distracted by the war between the US and Mexico and nearly lost the peninsula. The Mayans attacked Spanish villages armed by English settlers from Belize and with guns distributed to defend Yucatán's secession in 1846. They regained 90% of their lands and held all of the Yucatán except Campeche and Merida. At the height of their revolutionary success, the Mayans inexplicably withdrew to their villages - reputedly to plant corn for the season. The war with the US ended in 1848 and reinforcements were sent to the Yucatán, where they drove the Mayans back to Chan Santa Cruz. The Mayans resisted for several years, but disease and weapons shortages forced them to surrender in 1901. After 50 years of independence, their lands became federal territory. In reality, the Southern and Eastern half of the peninsula remained a virtual no man's land to outsiders where the Mayans lived almost as they pleased. This changed in the late 1960s when coastal development began. The Maya were resourceful in harnessing energy, creating amazingly sophisticated works of art and engineering and sustaining a civilization for approximately 1,500 years. It has been shown that the Maya had attributes of the supernatural, and were masters of their environment. Their secret wisdom remains unknown, some people attributing it to extraterrestrials races, whose space ships are seen to this very day in Central and South America. As with ancient Egyptian Pharaohs, Mayan rulers filled vast cities with sky high pyramids, ornate and lavish palaces personifying the power of the great kings and their connections to the gods, and astronomical observatories which helped them created their calendars and plan their lives. The cause of the Mayan collapse came over decades with no one quite sure what happened. There is no one single explanation for this implosion, but some scholars seem to believe that environmental catastropy lead to a full blown meltdown - lack of food and polluted water which produced malnutrition and disease.